We were still at my parent’s house in Lebanon for most of the day today, so I decided to go for a short “barefoot” shakeout run in my Hattoris on the roads around Old Hickory lake. Even with the hills, the run felt pretty good, and was quite enjoyable. 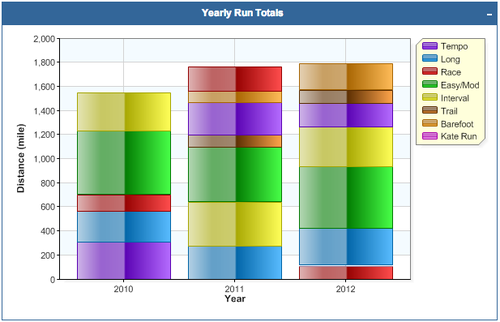 Also, during today’s run I crossed 1,800 total miles for the year! Quest for Boston – I’m Still Running! Over the past couple of weeks I’ve become a bit lax in keeping up with Tumblr, and specifically in posting running updates. Well, I’m still here, and I’m still working my way back to a full running schedule after the injury. Since completing the Chickamauga Half Marathon two weeks ago, I’ve continued to increase my mileage slowly and wanted to mention a few highlights. A week ago Thursday, I finished my second track workout since the injury. This particular workout was 3 x 1-mile repeats with 400m recovery in-between. At my peak I was running mile repeats with splits between 5:55 and 6:10. However, I had no idea what to expect after the long layoff. I had a hard time getting a feel for my pace while running, but was pleasantly surprised to run these three with times of 6:28, 6:17, and 6:14. Not quite up to my old self, but felt pretty good none-the-less. Well, that route kicked my tail! However, I finished it and know that I’ve got a lot of work ahead of me. Incidentally, the next day was when I was originally registered for the Harpeth Hills Flying Monkey Marathon, which consists of running the 11.2 loop in both directions. This run let me know that it was not just a matter of my MD advising me not to run the marathon, but also that I was not physically capable of running it. 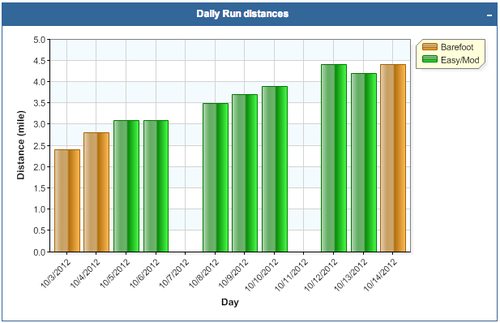 I feel pretty good about this considering I missed 6-weeks with the stress fracture. Not sure whether or not I’ll hit 2,000, but I’m not gonna push it to just hit a mileage total. Well, that’s the recap of the past two weeks. Tomorrow Olivia and I will be running Boulevard Bolt, which is one of the largest 5-mile races in the country (if not the biggest) with over 8,200 participants. Again, I’m not sure what to expect. My PR for 5-miles is 32:22, so I’m thinking that anything between 34:00 and 35:00 will be a reasonable goal. Anyway, hope everyone has a great turkey day!! Slowly, but surely, my speed and endurance are coming back. Tonight’s run was by far the best since coming back from the injury, and was a BIG confidence boost for the future. The conditions were pretty nasty (45º and raining), but I still felt FANTASTIC. My heart rate is coming down, and my pace is picking up. The totals for tonight were 7.9-miles completed in just over 1-hour. This comes out to a 7:39 average pace with 56:20 of actual running and 4-minutes of walk breaks. My average pace for the running segments was 7:23 per mile. This Saturday I’m scheduled to run the Chickamauga Battlefield Half Marathon (transferred from the full after my injury), with my doctor’s permission, even though tonight’s 7.9-mile effort was my longest in 10 weeks. I’m still not sure how I’m going to get through a half marathon, but right now I’m thinking about doing a 10/1 run-walk ratio. Regardless of what I decide, the goal will mostly be to just get through the race without injury, and give my training a jumpstart toward a successful spring racing season. Today was a glorious day for running or doing just about anything outside. For the first time in 10 weeks, I met up with our group for part of their Saturday run. I was also joined by Brian who has just moved to Bellevue with his family, and has been attending our church. Brian and I ran just under 4-miles out Old Natchez with the group before heading back while they continued. Our running pace was between the 8:20s and 8:30s, which felt very comfortable, and overall it was quite an enjoyable run. This run marked the end of Step 7 in my “return to running program” after completing similar runs on Wednesday and Friday (did a track workout on Thursday). From this point forward, my instructions are to increase the length of my longest running segment by 5-minutes every 3 to 4 days, with one day rest in-between. However, I’m now free to begin doing more speed work, and to begin adding hills back to my training. 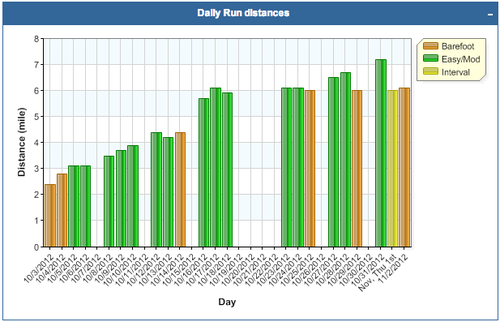 This means I’ll be able to start running in Percy Warner Park Again….YEAH!!! 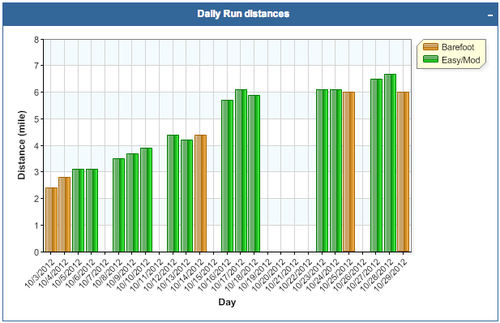 Even though there has been some frustrations along the way, overall my return to running has gone extremely well. 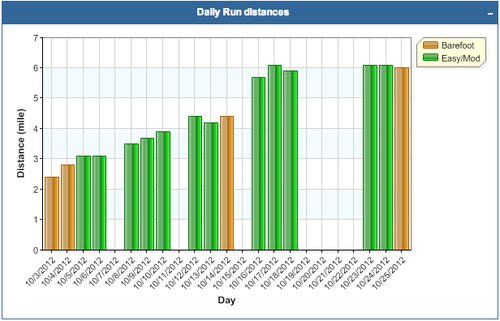 I ended up completing 97.8-miles for the month of October, and 33-miles last week. Not quite where I was before, but way ahead of where I thought I’d be starting November. Thanks to everyone for your continued support. Tonight, for the first time in 10 weeks, I returned to track with the Jim Spivey Running Club (JSRC), and it was a whirlwind of emotions. My last time at track was one of the best workouts I’ve ever had, and then the next day my running came to a halt for six weeks, taking with it my hopes of running a BQ this fall. Overall I’ve tried to maintain a positive mindset throughout the injury and recovery, but tonight things kind of overwhelmed me. First of all I was nervous for a number of reasons. Also, I was reminded of how high a fitness level I had reached through the summer, and how far the injury has set me back. It brought doubts about whether or not I can ever get to that level again without injury. I realize that all of this is incredibly minor in the grand scheme of life, but it is also hard to express to others how important running is to me. However, I tried to push those emotions and doubts aside and just focus on having a good workout. I tried to remember that this is important milestone in my recovery, and how well things have been going so far. It helped that Paxton arrived as I was warming up, and it was great catching up with him. Tonight’s workout was very simple, 2 Sets of 3 x 600m, which seemed to be perfect for my first night back. I quickly realized that I had very little feel for my pace, but somehow I still reeled off somewhat consistent intervals. After an initial repeat of 2:32, where I was still trying to get loose, my next five intervals were 2:22, 2:22, 2:18, 2:22, and 2:18. While this was not quite up to my prior standards, I’m pleased with the consistency, and pleasantly surprised at how good I felt. It’s good to have reached a new milestone in my recovery, and I look forward to continuing to work hard and reach even greater heights in the future. After a less-than-steller Step 5, which was hampered by post-Disney fatigue, Step 6 turned out to be fantastic. This was especially true of the run yesterday in which I completed all of the running segments at sub-8min pace. Today’s run with Nathan was also quite enjoyable, though it was pretty chilly. This was the first run since last winter/spring where I had to wear tights. 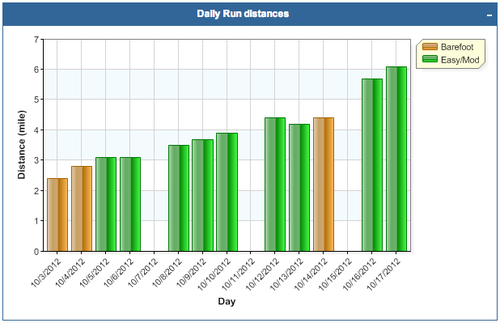 Also, last week I was able to finish just over 31-miles, and am just over 90-miles for the month. Both of these are well ahead of my expectations, especially considering I’m still on the “return to running” program. Tomorrow will be a rest day, and then hopefully I can start Step 7 on Wednesday. If everything goes well I should be able to begin incorporating speed work and hills into my training once I get past this step. I’m even considering making a return appearance at track with the JSRC this Thursday evening. With our Disney vacation over Kate’s fall break, I got a little side-tracked from posting updates on my “return to running” program. I only ended up running one time while at Disney World. I decided after the first day that running would only increase the stress on my right leg, which was already pretty intense from all the time spent walking and standing in the parks. Step 5 was originally only a single 20-minute run, which never made sense to me because Step 4 included 45-minutes of actual running. I ended up altering step 5 by adding an additional 15-min and 10-min running interval to the end with 1-minute walking segments in-between. Generally my feet and ankles have felt pretty beat up since returning from Disney, but I’m happy that my right leg continues to feel strong. The runs in Step 5 have been kind of meh, because I’ve been so tired since getting home on Monday night. However I’m glad to have Step 5 in the books. On average I’ve completed just over 6-miles with each run/walk in Step 5, bringing my weekly total so far to just over 18-miles. Yesterday morning I ran with Nathan on a modified version of our old “Nature Center Loop” starting from the Edwin Warner Park Nature Center. I could tell the difference in running 15-minute intervals vs. the 10-minute intervals in Step 3, but overall I felt really good. We kept the pace pretty chill during the running intervals, which was good since I had just done P90X Legs and Back on Monday night. In total we finished 5.74-miles in just over 54-minutes. Tonight after mid-week worship service I ran through the dark streets of Bellevue (and avoided a skunk). All day today my legs have been extremely sore from doing P90X Legs and Back on Monday night, so I felt a bit like the Tin Man during tonight’s run. Overall though I was pretty happy with my energy level, pace, and my heart rate which continues to improve. In total I finished just over 6-miles in just under 56-minutes. Lord willing, tomorrow’s run will be completed at Disney World!!! Looking back on the 10 days I’ve completed since my return, I guess I should be pretty pleased. Sometimes it mentally feels like I’m starting over, but I have to remind myself that so far I’ve been pain free, and I also got in almost 25-miles this week. Tomorrow will be a running rest day, and then “Step 4” should begin on Tuesday. Quest for Boston – How Can 4-Miles Make Me That Tired? Yesterday morning I went out for my second run of “Step 3” in the “return to running” program. I parked at the Green Hills YMCA, and ran through the surrounding neighborhoods. While I didn’t have any pain in my right leg, they did feel very tired from the run and elliptical on Friday. It is amazing to me how much harder a 10-min run / 1-min walk x 3 (Step 3) is than 5-min run / 2-min walk x 4 (Step 2). Even though I was tired, I still got it done, and finished 4.2-miles in just over 40-minutes (9:33 pace). After the run I went inside the YMCA and did 50-minutes on the elliptical, and then Olivia joined me for an hour aqua jogging in the pool. We closed out the effort with a yummy brunch at Noshville Deli across street with the Kiddos.